While an equal number of men and women respondents said they had been asked for a bribe or admitted to paying a bribe, the survey showed women mainly paid a bribe to prevent eviction – hinting at their vulnerable position in society, while men did so to improve their tenure security or speed up a land transaction. About 78% of land in Ghana is directly governed by traditional authorities, so the effects of gender-biased customary land tenure rules are far-reaching. Rubber farming is booming in Ghana’s western region. Several food crop and oil palm farms have been converted to rubber operations, as it’s more lucrative and rubber trees need minimal maintenance. With growing demand for land for rubber, the value of farms in the area has shot up. Starting a rubber venture may seem like a smart move for farmers, but it’s putting pressure on the land and in some cases undermining women's rights. By speaking to affected women, our chapter in Ghana found that traditional leaders – who own most of the land in this region – now prefer to sell the land to strangers with the highest bid, as opposed to local community members. These members told us they could not see any tangible development in the community to justify the vast tracts of land sold to outside investors over the years. However, the ruling chief has a different view. He told us the refurbishment of the palace was an example of how revenue from land sales had been used to improve the community. This struggle to access land is fuelling migration of young people, particularly young men, to urban areas in search of work. As women are expected to be responsible for bringing up children, their freedom to migrate is compromised. This leads to a situation where women remain in rural communities with a bigger responsibility to raise children, yet with fewer opportunities to access land. The fight against land corruption cannot be successful without empowering women to know their land rights so they can hold authorities to account. Our Ghanaian chapter recently worked on a participatory video project with 10 widowed women from Kulbia Village in the eastern part of the country. In this village, customary laws dictate that when a woman’s husband dies, the land they both worked on is taken away from her as preference is given to male-headed households. The aim of the project was to enable participants to document land issues affecting them, so they can push for change in traditional practices and, ultimately, put an end to the corruption and abuse they face. The participants planned and produced a 21-minute video, including an interview with the village chief and Tindana who committed on camera to supporting widows’ land rights and recognised the role corruption plays when land is taken away from them. The widows’ formal meetings and subsequent interviews with the village chief and Tindana were evidence of their growing confidence to assert their rights and overturn years of abuse. Once completed, the video was screened to the public at the local women’s resource centre. But the work doesn’t end here. The women have now been provided with a complete set of video equipment and they will continue using the power of media to document and expose issues they face. 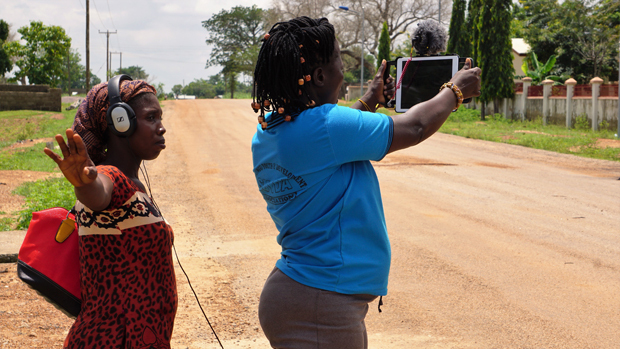 This participatory video was made possible by a joint partnership between the Ghana Integrity Initiative, local partner organisation Widows & Orphans Movement and InsightShare, a UK-based community development organisation.